Tina Jo Wallace as Mollie Ralston in The Mousetrap. When I reviewed another local production of this classic mystery about one year ago, it was my first experience of the play and I was struck by the self-awareness of the mechanics of the mystery format that seemed evident in the writing and emphasized in that particular production. Being an Agatha Christie fan from way back, I felt rather confident in that view. But this new rendition from Derby Dinner Playhouse does what all good theatre productions of classics should do if we are to care a wit for the result: make us see the material with fresh eyes. Watching the plot unfold this time, I was struck by the efficiency and assuredness of the structure and flow of the piece. Make no mistake, a group of individuals trapped in an old English country home with a killer is a well-worn device. But even clichés and stereotypes can be made enjoyable with the right amount of spin on the ball. This top-notch cast brought the characters to life in colorful fashion, making fuller realizations of what can seem like one-dimensional roles. My previous impression of the “European” Mr. Paravicini as an obvious and underwritten red herring was completely upended by J.R. Stuart’s delightful turn as the suspiciously charming Italian…or is it German? And that lack of specificity was what made this performance so engaging, as Mr. Stuart moved around the stage with such flourish and panache, delivering his lines in a plummy accent that hilariously suggested any number of European nations all at once. Peter Ripple was every bit his equal as the impish Christopher Wren; and his work, in conjunction with Janet Essenpreis’s Miss Casewell, highlighted an intriguing note of sexual ambiguity in the story. David Myers was properly stalwart as Major Metcalf; Elizabeth Loos was as annoying as she needed to be as Mrs. Broyles; and John Vessels was a splendid Detective Sergeant Trotter. As the married couple running the inn where it all takes place, Cary Wiger and Tina Jo Wallace did very good work, shifting from domestic bliss to a marriage strained by jealousy and suspicion without sacrificing their characters’ integrity. In fact, one of the pleasures of the second act was recognizing what a catalog of human weakness Christie had created. As we watch all of the relationships established in act one called into question and everyone begin to doubt their assumptions about each other, one could make a case that the famous author must have been quite a pessimist, and a believer in the ease with which normal and seemingly well-adjusted people can slide into mistrust. Perhaps it is the lot of any good mystery writer to be prone to a darker view of human nature, so as to realistically explore the criminal mind. 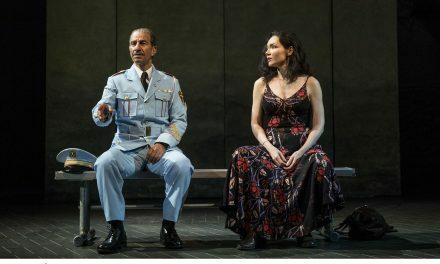 Whether this is true or not, what is beyond dispute is the exuberance and professionalism on display in this production. A good mystery may speak to our heart of darkness, but it can also tickle our funny bone, or make us swoon with excitement. Check out The Mousetrap and you will see what I mean.